The mechanical engineer has the responsibility for designing a commercial building’s mechanical system. This includes pipe, duct, and equipment used to distribute energy throughout the building. The objectives for insulating these components could be to save energy, maintain temperature control, protect personnel, or—on below-ambient systems—to prevent condensation. Most of the time there are multiple objectives to be met. The design engineer will design and specify the insulation type(s) and thicknesses based on the design objectives being considered. The following article provides a step-by-step approach to designing a mechanical insulation system suitable for a commercial piping project. Regardless of the type of project: hot or cold, indoor or outdoor, large or small, HVAC/R or plumbing, there are some basic steps that should be followed when designing a mechanical insulation system for a commercial project. A project will usually encompass several different applications and possibly subgroups within an application, each of which will have to be considered separately. Before we begin outlining the steps, I would like to emphasize that we are not just specifying the type and thickness of insulation to be used, but are designing a complete system. A system where all the application parameters, environmental conditions, and mechanical codes will be considered, as well as the various components of the system: insulation, jacket, pipe insulation supports, adhesives, coatings, sealants, fasteners, labeling, etc. will be compatible and work together to provide an application that functions efficiently. The ASHRAE Handbook’s Chapter 23 “Insulation for Mechanical Systems,” provides general guidelines for designing a mechanical insulation system. However, each application should be evaluated based on its individual parameters and local conditions. The National Commercial & Industrial Insulation Standards Manual (www.micainsulation.org), also known as the MICA Manual, goes into more detail and also provides insulation design plates where the designer can fill in the type of insulation material. The Mechanical Insulation Design Guide (MIDG), which is linked to on the National Insulation Association’s (NIA’s) website at https://insulation.org/resources/system-designmidg, is another great resource for information. Once the HVAC/R and plumbing requirements for the job have been defined and grouped by category and the piping has been laid out, we can begin to think in more specific terms about the mechanical insulation requirements. However, even in this initial phase, the engineer needs to be aware of where each insulation system will be located on the project to allow the necessary space needed (e.g., distance between pipes in a run or along a wall, etc.) for the insulation’s system thickness (i.e., insulation plus all parts of its system, including jacketing or accessories). The next step is to define why we are insulating and what outcome we hope to achieve by insulating the piping. Are we looking for energy savings, condensation control, maintaining process temperatures, burn protection, or an acoustical component? There may be various sub-systems that need to be broken out for special consideration. This step involves reviewing the layout of all the pipe and tubing sizes, lengths, supports, fittings, flanges, valves, etc. Identifying the process temperatures of the equipment being insulated in the various applications of the job is the next step. This will narrow down the choices of insulation materials and help determine the thickness required, although this will not be the only parameter used in determining thickness. NIA’s Insulation Materials Specification Chart (https://insulation.org/about-insulation/system-design/techs-specs) is a great resource for reviewing the high and low temperature use limits on a variety of insulation materials. Note that the guide is based on ASTM International Specifications, not individual products, so always double-check the manufacturer’s data sheet before finalizing the specific product selection. With a few exceptions, most mechanical insulation materials (although they vary in form [fibrous, cellular, granular, etc.] and composition [non-petroleum base and petroleum base]) have thermal conductivity values in a fairly narrow range: 0.24–0.30 BTU (hr/sqft-F) as indicated in the Insulation Materials Specification Chart. Density becomes a selection criteria when considering the specifics of how the insulation will be treated; if it is likely to undergo certain wear and tear or withstand pressure, then a heavier density might be chosen. The environmental conditions of each sub-system should be defined next. For indoor applications, this is usually straightforward, but should not be taken lightly. As an example, you should consider whether the conditioned spaces are always temperature/humidity controlled or whether are they intermittently uncontrolled—in which case they must be considered unconditioned or uncontrolled and treated as such. Outdoor applications involve greater extremes in temperature, humidity, wind, etc. and will always require some type of abuse or weather protection for the insulation system, (e.g., coating, jacketing, etc.). In addition, many current mechanical codes require jacketing or coatings on exterior piping for most insulation materials to protect against ultraviolet (UV) degradation from the sun and all the other elements insulation is exposed to outdoors (e.g., wind, rain, birds, vermin, foot traffic, etc.). The type of protective covering required will depend on these and other environmental and personnel conditions, the expectation of the owner, and the cost, among other considerations. Typically, the most extreme conditions should be designed for—unless it is completely impractical. When the extreme conditions can’t be designed for, accommodation must be made for when the design conditions are exceeded, particularly when the purpose of the insulation system is condensation control or burn protection. The specific insulation system (types) that are appropriate for a given system can be determined using the pipe and tubing size, process temperature, environmental conditions (e.g., humidity), and the overall goal of insulating the system. Experience and past history by local insulation contractors with certain insulation materials should be considered and may play a role in this selection process as well. For example, specifying a product that is difficult to obtain or is not familiar to the local insulation contractors may result in a project that is over budget on bid day. By reviewing the insulation system requirements more closely, one can select the best insulation for the application. Ease of installation (flexibility or rigidity), project conditions, moisture resistance, need for a load-bearing component, clean room requirements, compatibility of the insulation and the type of piping being used, pipe and tubing size, cost, etc. will all play a role in selecting the best insulation assemblies from the possible materials that meet the mechanical code, system conditions, and environmental condition parameters. Some engineers try to use one type of insulation on an entire project; this approach may diminish performance and may not be the most cost-effective approach. Using different types of insulation on large (over 8”) and small (run-outs) piping—even for lines that are operating at the same temperature and under the same conditions—often provides system advantages in performance and cost if compatibility is considered and the system is designed properly. Once the insulation type has been established for the specific application, the minimum insulation thickness can be determined by the applicable current local mechanical code, which usually specifies thickness based on pipe and tubing size or process temperature by either thickness in inches or R value. Be careful to make sure the specified insulation thickness will meet the mechanical code requirement for the installed condition, not just the nominal manufactured factory thickness. Local mechanical codes vary and should always be double-checked to be sure they are consistent with the project’s site location. The Mechanical Insulation Design Guide at https://insulation.org/resources/system-designmidg has a number of easy-to-use calculators that can assist. In determining thickness for condensation control or burn protection, environmental conditions are extremely important (e.g., ambient temperature and relative humidity). In addition, wind speed or the emissivity of the insulation’s outer surface/jacket (if required) plays a key role in determining the thickness of the insulation required to inhibit condensation. Again, the thickness should be calculated based on the most extreme conditions if possible, or accommodations will have to be made for when the design conditions are exceeded to prevent system failure. In addition to the insulation calculators, NAIMA’s 3E Plus® insulation software program, which can be downloaded from www.pipeinsulation.org, is a very helpful tool for determining insulation thickness. 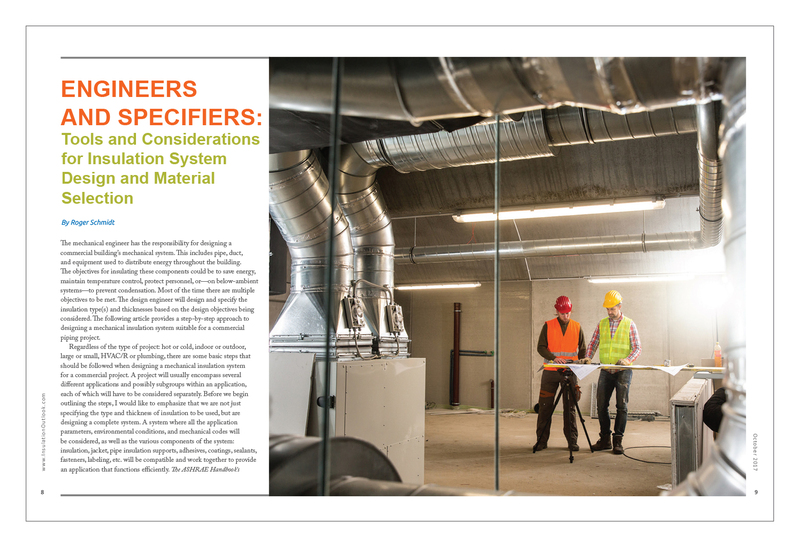 For more current product-specific information, many insulation manufacturers have similar programs that are specific to their products and may provide more accurate, updated information. One source for information on individual manufacturers’ products is the MTL Product Catalog found on NIA’s website. Also, one note of caution in determining insulation thickness: one of the easiest mistakes to make is to use the thickness recommendations for energy conservation when you are trying to control condensation. Energy conservation thickness recommendations are not applicable for condensation prevention and will usually be far below what is required for condensation control in most regions. Another common misstep when designing condensation-prevention systems is to not factor in the effect emissivity of the insulation/jacket will have on the insulation thickness. One of the biggest myths in insulation design is to over-specify thickness in lieu of a needed moisture vapor retarder/barrier. Increasing the thickness will not take the place of a vapor-barrier system in condensation-control applications, especially under humid conditions. The last step in the process would be to review the entire project, looking at all the applications within the project to be sure all elements of the design are working together. The layout should allow for the engineered insulation thickness specified. Take note: the number one complaint of insulation contractors/installers is that there is not enough space for the pipe insulation system as specified. This can lead to delays in the installation schedule or the insulation being reduced—resulting in a reduced system performance. All parts of the system should be specified, including vapor retarder systems/jacketing and vapor dams (where required), pipe and tubing supports, and any other needed materials. It is also important to specify detailed explanations on how to install the insulation in difficult areas such as valves (e.g., use of removable insulation if required), and vessels. During this step, the issue of aesthetics can also be considered. The system may function properly, but if it does not look good, it could be an issue for the owner. If uniform appearance is a particular concern, it is advisable to specify one brand type within the same room or area. Differences in brand type will likely not be noticeable in different areas, but using different types of materials from different manufacturers within one room—while they may perform equally—may not look exactly alike (e.g., color [shade] variation or outer diameters not matching perfectly), which may give the appearance of a “patchwork” installation. The use of pre-fabricated products (e.g., pre-fabricated fittings, insulation with factory-applied jacketing, or the use of pre-applied adhesive to the insulation/insulation jacket) may be specified for numerous reasons, such as faster installation or better performance. Basic manufacturer installation instructions or recommendations can be part of the specification for each system, as well as a project inspection process detailing when and what should be inspected at various steps during the installation. Product submittal sheets/data sheets should also be reviewed for compliance with engineering specifications and local code requirements. Current product data sheets should be thoroughly reviewed to be sure each product is compliant with all regional mechanical insulation codes for the application as well as the requirements of the insulation material standard. To be sure the insulation materials and products used in the project coincide with what was specified, a no-substitution clause can be included in the specification design—this should specify that there will not be a product substitution that could affect performance (as a note, this does not mean that there can be no brand substitutions as long as performance is the same). This will ensure no product substitutions are allowed unless submitted to the engineer on record in writing. The rationale for the substitution, cost variances, data sheets, and samples of the product being proposed to be substituted must be supplied and approved 60 days prior to the installation. This provides assurance that the specified design will perform as designed. Another note of caution: selecting an old thermal insulation system design from the engineering archives and using a cut and paste method to adopt it for new projects may speed up the design process, but is also fraught with peril because of differing environmental conditions. Similarly, a design for a project that performed well in one region—for example the cooler Northeast—may not work in the humid Gulf Coast region because of different environmental conditions or local mechanical insulation codes. This is particularly true for applications where condensation control is one of the primary goals of the insulated pipe and tubing system. By evaluating the system at this stage of the project, you will be ensuring that all the materials and accessories in the system are being specified and that all the elements will be compatible and work together to ensure the thermal insulation performance on this project. By following the above steps in the order designated, the mechanical insulation system should meet the expectations of the project in a long-term, cost-efficient manner. The next step is to get a quality, professional insulation contractor that is experienced and can install the system properly. As a final note, I would like to encourage engineers, particularly those who are newer to the industry, to take some time to observe insulation installation in the field. While on site, you are more likely to notice the things that need to be tweaked, the gaps, what’s missing, or what’s not really working. It is important to look around at the changes in the application requirements and the products available to meet those requirements. Seeing how systems are installed and working with insulation contractors will improve your ability to design the best systems. This article was published in the October 2017 issue of Insulation Outlook magazine. Copyright © 2017 National Insulation Association. All rights reserved. The contents of this website and Insulation Outlook magazine may not be reproduced in any means, in whole or in part, without the prior written permission of the publisher and NIA. Any unauthorized duplication is strictly prohibited and would violate NIA’s copyright and may violate other copyright agreements that NIA has with authors and partners. Contact publisher@insulation.org to reprint or reproduce this content.